We Fools can't imagine ourselves ever hitting the sell button on these three businesses. Finding winning stocks is tough. That's why we Fools tend to hold on tenaciously when we think we have bought a winner. So what stocks do we currently own that we plan on holding forever? We asked that very question to a team of Fools, and they picked Alphabet (NASDAQ:GOOG) (NASDAQ:GOOGL), Brookfield Property Partners (NASDAQ:BPY), and MarketAxess Holdings (NASDAQ:MKTX). Anders Bylund (Alphabet): " Never" is a very long time, but I certainly don't have any plans to sell my holdings in Alphabet for the foreseeable future. The company is best known for its Google-branded range of online tools and services today. Through Google, Alphabet dominates the lucrative fields of online search and advertising. YouTube is another market-defining property under the Google umbrella. The Android platform for smartphones and tablets also dominates its industry on a global level, again under Google's aegis. It's safe to say that you know what the company does, and you probably use its services every day. The Google segment provided 99% of Alphabet's total revenue in the recently reported fourth quarter. In short, Alphabet is Google. And with Google's sales rising 22% year over year, driving operating income 17% higher, that's not a bad thing. But Alphabet won't look like that forever. So Alphabet is getting ready for the day when online search and marketing no longer supports a strong business foundation. Other bets include self-driving cars, advanced medical research, the Google Fiber high-speed internet service, and the Nest line of smart thermostats. Beyond these familiar names, Alphabet is working up many more not-so-obvious business ideas out of the public eye. Any or all of these experiments may turn into profitable businesses one day, and the Alphabet company was designed to contain many long-term bets on the far future. Some of the so-called moonshots contain an online element, but others don't. In short, Alphabet is remaking itself as a whole new kind of industry-spanning conglomerate. With or without the internet, Alphabet will be around for the very long haul. The company is just getting started, using Google to kindle the fires under a brand new bundle of growth engines. Matt DiLallo (Brookfield Property Partners): I'm a firm believer that investors should hold some form of real estate for the long term. The numbers back up this view, as investors who added real estate or other alternatives to a portfolio of stocks and bonds have significantly outperformed those holding a more traditional portfolio over the long term. While there are plenty of good ways to get into real estate, the best, in my opinion, is by investing in Brookfield Property Partners. The real estate partnership owns a core portfolio of office properties in gateway cities around the world and a significant stake in leading U.S. mall owner General Growth Properties (NYSE:GGP). In addition, it has investments in several opportunistic real estate funds that hold stakes in a variety of other property classes, including multi-family, industrial, and hospitality. That makes it a one-stop shop for real estate investing. These real estate portfolios throw off very predictable cash flow, 80% of which Brookfield Property Partners distributes back to investors through a generous payout currently yielding 5.3%. Meanwhile, the company reinvests the other 20% into redevelopment projects to obtain higher rents. The upside from those redevelopment projects, when combined with rent escalations and development projects in the pipeline, provide Brookfield with the ability to increase its payout by 5% to 8% annually over the long term. That steadily growing payout, along with capital appreciation across its portfolio, should drive 12% to 15% annual returns for investors over the long term, which is why this is one stock I'd never consider selling. Brian Feroldi (MarketAxess Holdings): Did you know that the majority of fixed-income trading still takes place over the phone or by email? Given the ubiquity of electronic trading in the stock market, I was shocked to uncover this fact. But now MarketAxess is attempting to bring the bond markets into the 21st century. The company operates the biggest online bond-trading platform in the world, making it easy for its users to buy, sell, or research fixed-income securities. Not only does this platform make far more sense than holding one-on-one conversations to transact, but it also brings a whole new level of transparency to this market. Being the top dog in this small but growing niche provides MarketAxess with a big advantage. Just like every other marketplace, bond buyers and sellers will naturally gravitate toward the largest platform since it maximizes their chance of getting a good price on either side of the transaction. This network effect will make it nearly impossible for a potential rival to catch up. One big financial benefit of running an electronic trading platform is that it costs the company very little to add one more user. That means the company's margins can consistently expand over time, allowing profits to grow at a much faster rate than revenue. Over time, I'm convinced that the benefits of trading electronically will persuade more and more market participants to sign on the company's platform. 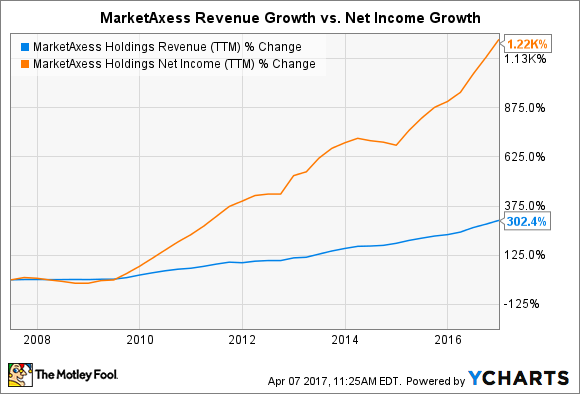 With plenty of market share left for MarketAxess' to capture, I think the company's torrid revenue and profit growth rates should only continue from here. That why I plan on holding on to my MarketAxess shares indefinitely.